Hyderabad police revealed the whole scene of cold blooded murder of a pregnant woman. The Cyberabad police department have arranged a press conference under the lead of Sandeep Shandilya, Cyberabad Police commissioner to reveal the actual cause and background of a cold blooded murder in the recent times. On January 30, 2018 Cyberabad police reached Sriram Nagar beside the Botanical garden of Kondapur after they got a call from public about a blood stained abandoned gunny sack left on the streets and spreading of foul smell from the sack. The police found a mutilated body of a woman chopped off and filled in two gunny sacks at the place. Police sent that two bags which stuffed with head and legs in one and the torso in the another for the post mortem to the Osmania General Hospital. 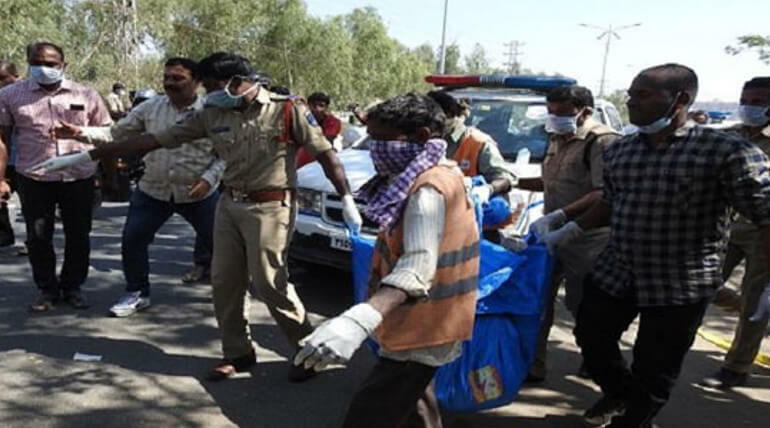 The police had left with no clues other than those two bags and the incident had left the Cyberabad police department in complete distress due to the continuing female murders in the city. The post mortem report stated that the corpse belongs to an eight months pregnant woman. The report also reveals that she had been chopped off after two days of her death and some cracks and injuries in the pelvic and the heap region shows that she was beaten up to death. The women could be 30 years old and probably belongs to the state of UP or Bihar. The police got nothing more than that. Suddenly they got a break through in the case by the CCTV footage. They started to check with every cars that passed the way but again they left with nothing. Then they started to check bikes as they had doubt over the bloated body of the victim may occurred due to it may carried in bike. Later police clocked up a bike with two riders and a black big bag in the hands of pillion riders, a male and a female. Through the number plate verification, police first plotted that was the bike of a bar manager, who lend his bike to his bar tender on that day. In the deeper investigation on the go, police revealed the actual story of the crime. On February 12, 2018, Cyberabad police have accused Vikas Kashyap and three members of a family in the murder case. Cyberabad police said that the women who got murdered was Bingee alias Pinky (32) partner of Vikas Kashyap (35) and the motive of the murder was an act of breaking the barrier for Vikas Kashyap's extramarital affair. According to police, the primary accused was the Vikas Kashyap and AmarKanth Jah (21), the bar tender. The secondary accused was Mamatha Jha (35), Amarkanth Jha's Mother and Anil Jha (75). Bingee's native was Bihar. Thirteen years back she got married with Dinesh and settled down with him in Uttar Pradesh. Dinesh and Bingee had three kids together. Vikas kashytap, who lived in the same village had made his relationship with Bingee. Later Bingee eloped with Vikas with her son to Bihar in 2017. In Bihar Vikas managed to create an illicit relationship with Mamatha Jha but the relationship had no such secrets but it was extremely public among the villagers. Vikas and the Jha family totally shifted up to Hyderabad by leaving Bingee alone. After a long time Bingee managed to find Vikas and the Jha family and arrived to Hyderabad in 2018. She reached the settlement of Jha family and Vikas and ended up with them. Shandilya said, Bingee was restricted for her every move as they got a feeling of restriction from Bingee for the relationship. Hence they planned to murder Bingee. later Vikas and Mamatha pinned Bingee on the wall in a hot conversation. When Bingee collapsed down the accused keep kicking her till her death hence she got cracks and injuries in the pelvis and heap bones. Later they kept her corpse in their house for a day and the next day Amarkanth Jha brought up a marble cutting machine and mutilated her body. Then they packed them in plastic bags and bagged up in gunny sacks. On the early hours of January 30, Amarnath and Mamatha carried the bag and dumped it down at the place, where it was found later due to decaying smell. Amarkanth Jha had escaped to Bihar via Secunderabad and Vikas was still absconding. Mamatha Jha and Anil Jha had been arrested said Commissioner Shandilya. Bingee's eight years old son has been rescued by the team and soon Amarkanth and Vikas will be trapped down, Shandilya hopped for the arresting the primary criminals as soon as possible.